Six months after Google announced it is bringing podcast support to its Play Music app, it has finally landed… in the U.S. and Canada, at least. Users can now subscribe to their favorite shows through Play Music on Android and on the web, and find new ones based on various topics, feelings, and activities. 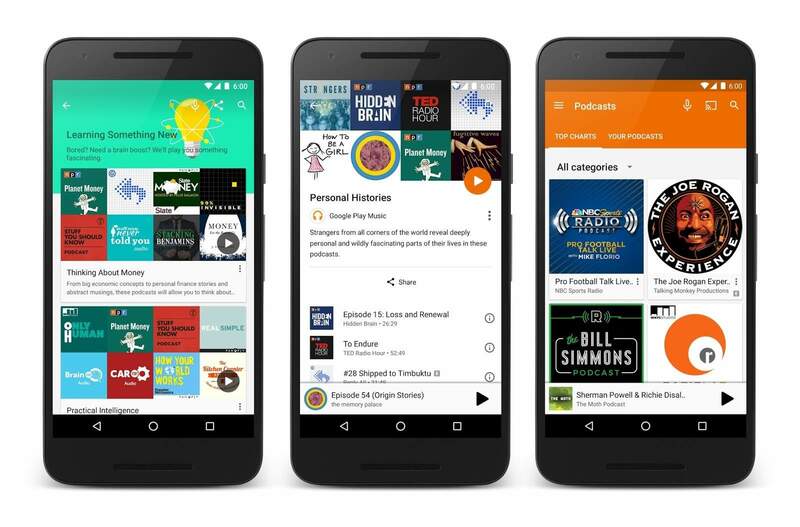 “Similar to our contextual playlists for music, we want to make it easy to find the right podcast—whether you’re a podcast aficionado or listening for the first time,” Google explains. You can find shows for a lazy Sunday afternoon, or to motivate you on the journey to work. This is more than just your typical podcast client in which you simply find and subscribe to shows you’re already familiar with, then — or choose from a list of top tens. However, there are charts for different categories, too. Google has teamed up with all kinds of content creators to bring you the best shows — that’s probably why podcast support took so long to get here — and if you host your own, you can submit it through the podcast portal. When you find a show you like, you can subscribe to download recent episodes to your device, and to receive notifications when new ones are available. There’s no word on when podcast support will be available in other countries, or through Play Music on iOS, so we’ll have to wait for more information.